CBS News is calling the race between indicted Democrat Representative from Louisiana, William Jefferson and politcal newcomer, Anh “Joseph” Cao, a Republican Vietnamese-American, for Cao. Democrat Jefferson was indicted after he was discovered to be hiding $90,000 in bribe money in his freezer. Democrat Jefferson was also reported to have diverted a Military rescue crew to his home during rescue efforts after Hurricane Katrina, to retreive personal items of his. Even though under indictment, Democrat Party leadership allowed Democrat Jefferson to retain his seat in the House of Representatives. The election of Cao, in a predominant African-American Democrat stronghold, denies Democrat Jefferson a tenth term in the United States House of Representatives. 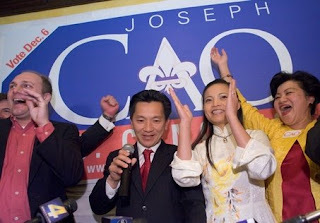 Cao is the first Vietnamese-American that will serve in Congress. One crooked Democrat gone, several more hopefully to follow.